Get lit, win big. Then go home to the kids when “The House” arrives onto Blu-ray Combo Pack, DVD and Digital HD. The comedy stars Will Ferrell and Amy Poehler in their first big-screen pairing. From New Line Cinema and Village Roadshow Pictures, “The House” also stars Jason Mantzoukas (“The Dictator,” TV’s “Brooklyn Nine-Nine”), Nick Kroll (“Vacation,” TV’s “Kroll Show”), and Oscar nominee Jeremy Renner (“The Hurt Locker,” “The Town”), as well as a supporting ensemble including Allison Tolman, Michaela Watkins, Ryan Simpkins, Jessie Ennis, Rob Huebel, Christina Offley, Rory Scovel, Lennon Parham, Cedric Yarbrough, Kyle Kinane, and Andrea Savage. Andrew Jay Cohen makes his feature film directorial debut with “The House.” The script was written by Brendan O’Brien and Cohen, whose previous collaborations include the hit comedy “Neighbors.” The film was produced by Nathan Kahane, Joe Drake, Brendan O’Brien, Andrew Jay Cohen, Jessica Elbaum, Will Ferrell and Adam McKay. Marc S. Fischer, Chris Henchy, Spencer Wong, Toby Emmerich, Richard Brener, Michael Disco, and Bruce Berman served as executive producers. 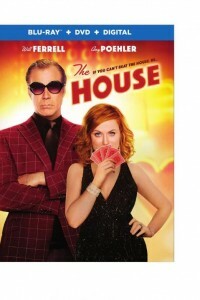 .The House: Playing with a Loaded Deck – Pranks, practical jokes and unpredictability. Watch Will Ferrell, Amy Poehler, Jason Mantzoukas and a full house of all-star comedians go all in during this hilarious and highly inappropriate look backstage that you won’t be able to unsee. .If You Build The House They Will Come – Discover how the cast and crew transformed an ordinary quiet suburban house to a full-blown underground Vegas-style casino complete with high-roller tables, a pool party and Fight Night, and how the cast went to poker school, learning to place their bets from the pros.